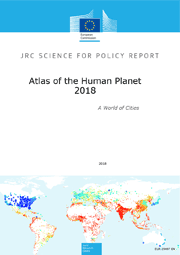 The Atlas of the Human Planet 2018 describes the Urban Centre Database, produced in the framework of the Global Human Settlement Layer (GHSL) project, by applying a global definition of cities and settlements to the GHSL data. The Atlas presents the key findings of the analysis of geographic, environmental and socio-economic variables that were gathered from free and open sources for each urban centre in the world. 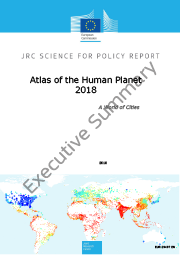 The Atlas of the Human Planet 2018 is based on the UCDB, which relies on the GHSL data. 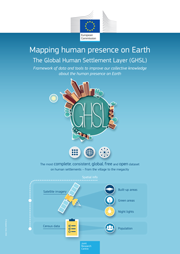 GHSL combines satellite and socio-economic data to produce high resolution, global open information on built-up area and population. In the current release, it covers the epochs 1975, 1990, 2000 and 2015. The data sets are used in combination with socio-economic data sets to understand, where and in which built environment people live, and how the settlements and the population change over time. This knowledge is used in policy areas including environmental impact assessment, disaster risk assessment, transport, health care services, education, natural disasters and hazards and urban planning.